What’s the difference between Pak-o-Bird and Birdie GoGo Carriers? 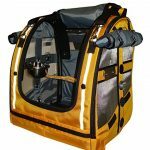 The right travel carrier for your parrot: it has to be both safe and comfortable, give you the peace of mind that your bird cannot escape, and very importantly: a carrier that a parrot can feel secure in without stress while travelling. A quality bird carrier can last the entire lifetime of your parrot. So it’s well worth taking the time to decide which one is right for your bird. Most birds will naturally take time to get used to a new transport cage, but choosing a high quality and well designed travel cage or carrier makes all the difference. We now have more styles of bird carriers than ever to choose from, which is a good thing. Whether it’s a simple wire cage to transport your bird to the vet, or a specially designed luxury parrot backpack that you can take your feathered kid out in on hiking adventures; there’s a carrier for every bird species, personality, and lifestyle. Having at least one reliable, safe, secure travel carrier is absolutely vital for any parrot parent in case of emergencies and for regular vet check-ups. And those parrots who are lucky enough to accompany their human family on day trips and outings can certanly be provided with more than one type of travel carrier or cage, depending on the occasion and how long they’ll be required to be in it – as well as the mode of travel. 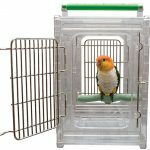 This guide details all the different types of travel cages and carriers that are made specifically for birds, from budgerigars right up to the largest and strongest Macaws and Cockatoos. This cage is as solid as they come and as you might expect, it’s reflected in the weight. This is certainly one of, if not the largest and heaviest cage that would still qualify as a travel cage (far to small to be used as a regular cage). If you want something light and ultra portable then the Pawhut won’t really tick that box, but if you need something rock solid with peace of mind safety and security for big, beaky parrots then this is the ultimate because it doesn’t get any more beak-proof than stainless steel. The weight also comes from the fact that the ENTIRE thing is stainless steel including the bottom slide out tray, the handle the food bowls, and even the perch. Now I’m a lover of stainless steel everything when it comes to parrots, but a steel perch is going a little far to say the least. It might be virtually bullet proof but as for comfort and safety levels, a lot to be desired. There’s nothing comfortable or healthy or safe about a parrot standing on a metal perch. Thankfully the supplied perch can be removed and replaced with a suitable natural wood or other perch that you can attach or fit between the bar spaces. Perch aside as a flaw, but one that’s easily rectified, this cage is very easily cleaned thanks to the stainless steel build. 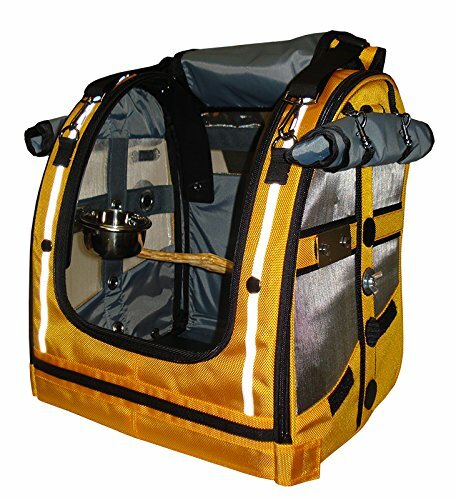 A parrot backpack carrier makes it possible for you to take your bird places safely and comfortably. One of the first things that people ask when they see this style of carrier is: is it really safe? Can’t the bird easily escape from a soft looking backpack? The only answer to those questions is to only consider high quality, proven products and to skip anything cheap or questionable. No one wants to risk their bird escaping just to save a few dollars. 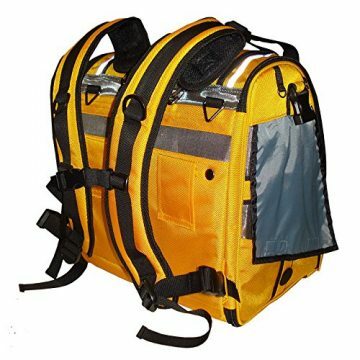 Note that the foremost manufacturer of top quality parrot travel backpacks has regularly discovered cheap imitations of their products – these are often dangerously low quality and need to be avoided at all costs. Additionally, any caring parrot owner will have some concern about how a bird will react to being enclosed in this sort of carrier. The answer to that is not so black and white. As we all know, each and every parrot is an individual. You are the only one who will know whether you think your parrot might automatically take to the backpack without hesitation, or whether you will need to work with him/her to develop confidence and comfort (which will be the case with most birds). Will your bird enjoy being in the backpack carrier? Every bird is different, and certainly some will not take to this sort of environment. On the other hand, lots of parrot owners have found that their birds do indeed get used to the carrier and soon associate it with fun outings like hiking, bird club meetings, or just random trips and adventures where you want to take your feathered kid along too. There are not a whole lot of companies making backpack style bird carriers, but the best known and most highly regarded brand currently is Celltei with their Pak-o-Bird parrot backpacks. These are high class bird travel carriers; yes they’re not the cheapest thing you’ll ever buy, but anyone who has a bird that gets out and about regularly will likely find that the investment pays itself off pretty quickly. Celltei have without a doubt put a lot of thought and planning into designing these birdy backpacks to provide both comfort and peace of mind. You absolutley need peace of mind that your bird will be safe and secure. You also want to know that he or she will be comfortable and not stressed out. While the design of the carrier is vital in making sure these things happen, just as important is the way you train and get your parrot used to entering and being inside the carrier. For most birds that will mean slowly introducing them to the backpack, leaving it open, and then gradually getting the bird used to being enclosed until he associates it with rewards and happy things. The Celltei Pak-o-Bird line of parrot carrier backpacks comes in many sizes and to cater to of every bird size. Some have specific design features to make them more suited to specific bird species. They have backpacks from X-Small up to X-Large sizes. The company became so dedicated to making high quality, unique parrot-safe backpacks that they have designs that they specifically developed for escape-artist “must-destroy-everything” cockatoos, and even a custom sized backpack specially designed to fit the long tails of large Macaws. It’s wonderful to see a company pay so much attention to detail and listen to customer feedback. Celltei Pak-o-Bird backpacks are lightweight, and come with a natural wood perch, stainless steel food and water bowls, toy attachment, and roll down shades on the sides for extra security while you’re travelling. They are made of tough and safe nylon with polyurethane coating which is able to repel water rather than soak it up and become damp. The mesh windows might look like a weak point, but are made of stainless steel so can not be chewed through. Celltei has gone the extra mile to make sure that every part of the carrier is both bird-safe in the materials used, and made with security as a top priority. For what it is, this is by no means a low cost carrier. And like all enclosed backpack style carriers, it’s not going to suit every bird. Some birds – potentially many – aren’t going to be comfortable in this enclosed environment. If you’re really adament about using a backpack for your parrot, you should be prepared to have the patience and time to get your bird used to it gradually until they are clearly comfortable and not showing stress, fear or panic. Back to the Birdie GoGo – made by the most famous bird backpack company Celltei, expect high quality at a high price as with most of their products. If you are leaning towards buying one of the Celltei backpacks but not sure which one is the right one for your parrot, I’ve put together a quick comparison of the Pak-o-Bird and the Birdie Gogo so we can see the main differences which might not be so obvious when viewing the pictures online. The Birdie GoGo is less bulky than the Pak-o-Bird – which is one reason that Celltei originally developed the GoGo as a more compact alternative for shorter trips. A material travel carrier for birds is lighter and more portable than a metal cage. But there aren’t a lot of options for parrots in this style of carrier, for obvious reasons relating to the ability of a parrot’s beak to make light work of softer materials. You also need to consider the need for a perch: and that’s why a standard dog, cat or rabbit soft carrier rarely works for birds. You need something that is both especially designed for parrots, and can stand up to their curious beaks with the use of tougher materials. 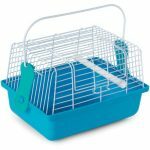 Small size suitable for: Small – Medium parrots: Budgies/Parakeets, Cockatiels, Lovebirds, Conures, Ringnecks etc. Carrying style: Shoulder strap + small handle at top of carrier. 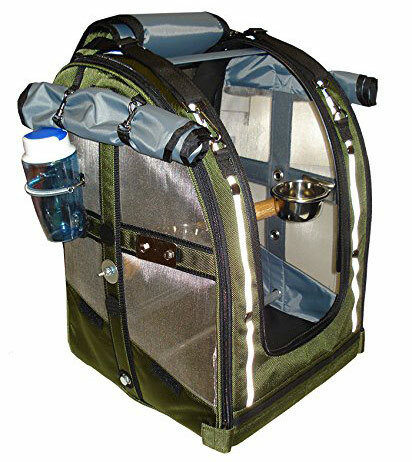 The A&E soft sided bird travel carrier is a simple design: inside is a removeable perch and the carrier zips up and down at the front with a heavy duty zipper. 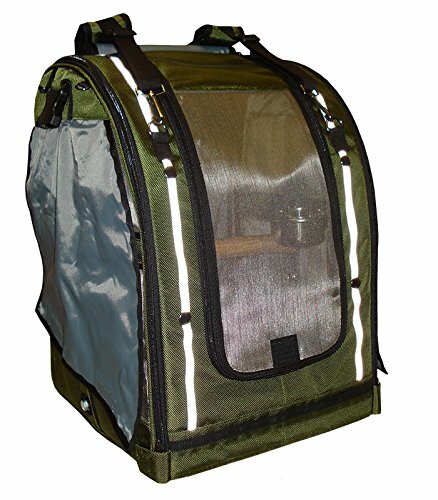 The back and front of the carrier is fitted with a mesh screen for airflow and visibility. The sides are solid so there is no potentially stressful stimuli on the side view while the bird is travelling. The A&E soft carrier is tough canvas-like on the outside (not cheap cloth or fabric like low quality pet carriers), and smooth vinyl inside which makes it easy to clean and wipe away poop as needed. The bottom of the carrier is attached with velcro so is easily taken out for a good clean, although most people will prefer to insert some newspaper which can just be disposed of. There are two perch positions so you can adjust it depending upon whether you have a long or shorter tailed parrot. The supplied smooth wooden perch might be too thin for some birds to find comfortable and to get a solid grip on while travelling. With a little imagination you could replace it with something a little thicker and with more grip, like a natural wood branch with rougher bark on it. There are two artistic designs in either green or black featuring attractive patterns (not that your bird will care, but they’re nice to look at!). It’s barebones inside. No room or safe/practical way of putting in food and water, or toys. It’s the type of carrier that you would not really want to leave a bird in for any longer than an hour at the most. 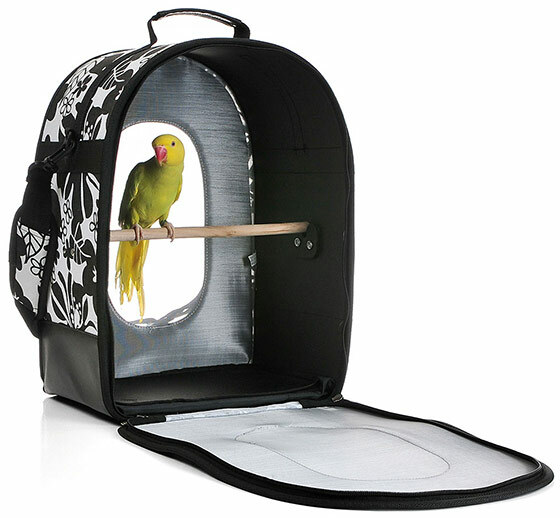 On the other hand if you’re wanting something for shorter trips then this carrier does what it’s meant to do: provides a safe enclosed space for most species of parrots to be in while travelling, with a front and rear window to be able to check out what’s happening outside and keep an eye on the human family. Being a soft material it’s unlikely to be a bird carrier that is really suited to most large Cockatoos or other big parrots that can make it a mission to chew their way out. The perch can be moved into two different positions. This leaves parrots with a longer tail, such as Indian Ringnecks, enough room for the tail not to touch the bottom of the carrier which can be a common problem with travel cages. Suitable for short trips only. No attachments or space for food or water bowls. Can take some parrots some time to become comfortable with being enclosed in the carrier. Patience + positive reinforcement training + being aware of your bird’s comfort level is essential. Perch removeable for cleaning or replacement, and adjustable into two positions to best suit the type of parrot and its tail length. Shoulder strap is padded and adjustable. Not ideal for large parrots due to size and insecurity of the soft material which would not stand up to cockatoos and other determined chewers. There’s a strong “either love it or hate it” sentiment with this style of clear acrylic style parrot carrier. The best ones are actually made of polycarbonate which is an extremely tough material. The benefits are obvious, with the material being tough as nails and unbreakable (unbeakable). But not all parrots will feel comfortable in this enclosed space. Parrot owners must use their judgement, instinct and attention to determine whether your bird is coping well and adjusting to travelling in a hard plastic style carrier, or whether you think a more open cage design would be more suited. The Caitec Perch N Go is designed for small to medium sized parrots. It is not generally suited to long tailed parrots or the large Cockatoos or Macaws. Polycarbonate material is as tough as it gets – no beak can get through it. There is no risk of a parrot chewing its way out. Solid metal grill door with quality closing mechanism is also escape-proof. 360 degree view: some birds love it, others will require part of the carrier to be covered with a towel in order to feel secure. The perch is adjustable and the top handle doubles as a perch when your bird is outside the cage. 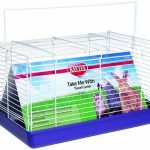 This type of transport cage is popular for small mammal pets like rabbits, guinea pigs and hamsters. The ones made for those animals are rarely suitable for birds for several reasons: bar spacing, lack of perch, inappropriate material, lack of security and so on. A guinea pig can’t bite its way out of a cage, but a parrot can, so if you’re looking at an open style plastic carrier for your parrot it’s good to know that there are now several which are designed specifically with birds in mind. These are small bird cages for species like Budgies and Lovebirds. If you need something for a Cockatoo or Macaw, you’ll be looking at one other carrier styles in this guide. 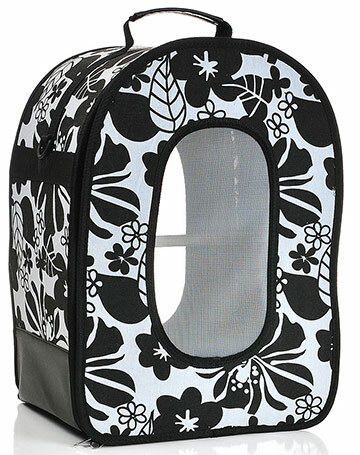 Medium sized Kaytee bird carrier is suited for the smallest parrots like Budgies and Lovebirds. Possible quality issues with the base coming detached from the wire. People have used cable ties to secure the plastic base and prevent any risk of detachment. 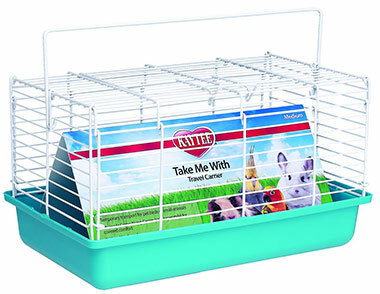 Kaytee Take Me With Travel Carrier – large. Large size will fit up to Cockatiel size. Made for small mammals as well but comes with a perch for birds. If you want to put a more comfortable thicker branch in as a perch, this would be easy to slide between the cage bars at a suitable height. 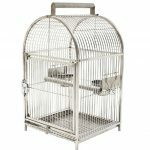 Prevue Pet Small Animal & Bird travel cage – Easy to take a bird in and out with the door opening from the front and over the top of the cage. The included removeable perch is plastic. You can replace this with a wood perch nestled between the wire if desired. 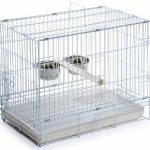 This is a small cage for very small birds going on short trips – Budgerigars, Parrotlets and Lovebirds. A folding or collapsible travel cage for birds obviously has a big benefit of being convenient to store when you’re not using it. 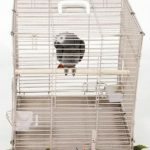 If you only have one parrot, storing a travel cage isn’t a huge deal, but if you have several then you can soon find yourself having to dedicate a chunk of house or garage space to transport cages. In any case, a parrot transport cage that is both safe and secure, AND collapses down for storage when not in use is an appealing option. There are a few quality products in this category, which you can check out below. 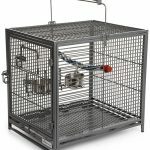 A&E Cage Co. are well known for their high quality bird cages. 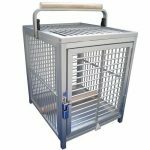 This is one of the strongest travel cages you’ll find, being made from powder coated wrought iron steel. 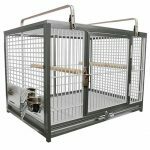 It’s suited for medium sized parrots like African Greys, Amazons, Conures, but will also comfortably fit most cockatoos and provides the strength required for them, which is often hard to come by in transport cages. This cage is almost a perfect square shape, being 19″ in both height and width, and 18″ in depth. It weighs 17 lbs and has a very sturdy, tough feel to it. 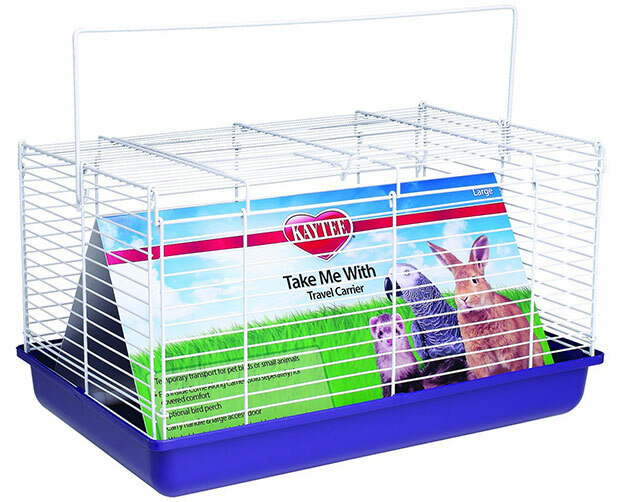 The carrier does come with two feeders and perches, though you might want to swap the supplied dowel style perches out for more natural, thicker branches for greater comfort. This A&E cage folds right down into a flat briefcase-like shape when you’re not using it and takes up very little space. The A&E collapsible transport carrier folds up like a briefcase for easy storage. It easily fits birds like African Grey parrots and larger, including most cockatoos. 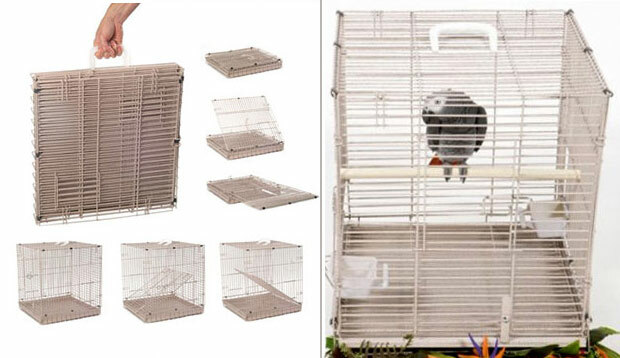 Finding a good travel cage for small birds is generally easier than doing so for bigger parrots. 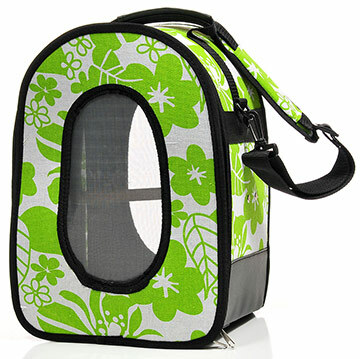 A small bird travel carrier is lightweight and easy to transport. The size that you need, however, will depend on what the purpose of your travel is. Going to the vet? A carrier that’s just big enough to be comfortable is normally fine. Too large of a travel cage can increase the risk of a bird iinjuing himself in the car, and a smaller space can make her feel more secure during the trip. If you’re planning a longer road trip though, a slightly larger carrier can be more suitable since you’ll be able to fit a few toys in, and a container of dry food if need be. Bar spacing: Most small cages will have a bar width that’s suitable for the smallest parrots like Budgies and Lovebirds. But sometimes a design might defy logic, and you’ll see a small cage with bars that are far too wide and can reuslt in a bird getting stuck or even escaping. For maximum safety, the smallest parrots require bar spacing of no more than 0.4 inches or about 1cm. A carrier that you can fold away when not in use is obviously convenient. Soft sided carriers, as featured above in this guide, are somewhat collapsible but in this section we’re focusing on cages that are designed to be folded up. One downside to this is that in a real emergency you’ll need to consider the time it takes to assemble the cage, and to insert to insert at least one perch. 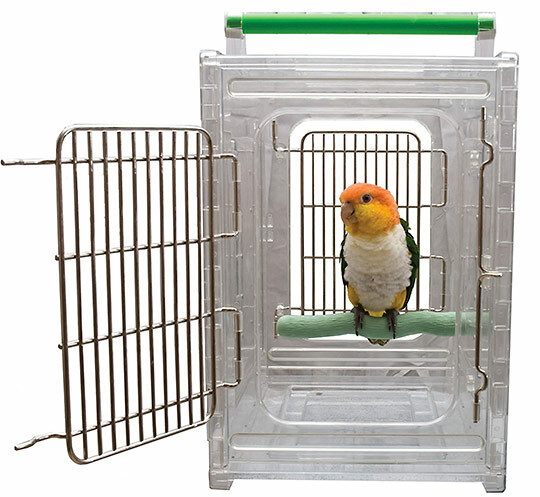 Having a perch ready to go that easily fits in the cage, and stored away with the carrier, makes this process fast and hassle-free. Some dog crates – most of them collapsible – can also make a good bird carrier. But there’s one main thing to look out for with these: the bar spacing. Most dog cages have much wider bars than a cage made for birds so these are generally not suitable for small birds. Even larger birds like cockatoos will be able to try and stick their heads through a dog crate with wide bar spacing so pay close attention to the specs of each cage. Any cage with a bar space of over 2.5cm or just under 1 inch is unlikely to be safe for any bird and should not be used for birds: they might not be able to escape, but getting their head caught between the bars is a real possiblity when the spacing is inappropriate. So a dog crate, due to its proportions of being longer than it is high, is not suitable in most cases for large long tailed parrots like Macaws. Cockatoos are the birds that are likely to be most suited to this type of carrier, as they (generally) have a short tail and are large enough to be accommodated iwth the wider bar spacing – however it is imperative that the bar width is noted and then checked for safety compatbility with your species of parrot. I’m disappointed that you didn’t include the “Wingabago” in your article. Thanks for your comment Susan, and noted. The article will always be a work in progress and I’ve made a note to update with the Wingabago. Thank you for the suggestion! Have a soft side carrier cage large ,we love it..We were wondering about the feet on the bottom of the carrier they seem to short , the case rests on the binding trim .We think it will wear out on binding.We is my Ectlectus ,me and my mom.